The death this week of Deborah Sussman, who passed away in Los Angeles at age 83, is notable in part because she was a woman able to carve out a vibrant and successful career in a field traditionally dominated by men. Sussman lived long enough to see her career receive critical attention, most recently as the subject of a retrospective exhibition, Deborah Sussman Loves LA, held last winter at Los Angeles’ Woodbury University Hollywood Gallery. That love is reciprocated. As the show’s title suggests, she is rapidly becoming canonized in Southern California; but this Los Angeles love story often overshadows one of the key aspects of Sussman’s career — her rise and influence as a woman working in the male-dominated world of postwar design. For all the Los Angeles boosterism, Sussman’s roots lie in Brooklyn, where she was born in 1931. From an early age, Sussman was pulled between her early desire to become an actress and her fascination with art and design. Although educated at Bard College — where she studied painting and acted in student productions — she was drawn to the eclectically avant-garde milieu of Black Mountain College where she spent a summer studying. But Sussman’s real awakening came during her junior year, when she decided to transfer her studies to the “New Bauhaus” at the Illinois Institute of Technology: what began as a short break from Bard grew into a three-year stay. Arriving without commitments, responsibilities, dependents or emotional ties, Sussman was thrust into a variety of roles, ranging from graphic designer to filmmaker and, ultimately, to the confidante of Ray Eames. Indeed, they fluidly moved between appointed work roles and, in later years, Sussman made a point of identifying for scholars the contributions of Ray Eames to the team’s work. Sussman’s long tenure with the Eameses undoubtedly helped her subsequent career, when she set up her own design studio. “Working at the Eames office,” she would later note, “was like getting a certification of value.” Perhaps ironically, however, those ties now obscure Sussman’s own early work; like her good friend Ray, Sussman found her own designs often subsumed under the larger Eames studio label. Perhaps Deborah Sussman’s best-known work — for the 1984 Los Angeles Olympics — is often associated with the California New Wave movement, but it also thrust her into an uneasy leadership role. As she recalls, being in charge of some 150 designers — most of whom were men — required subtle but firm leadership. “The male mafia” with whom she worked were dubious, and she remembered well an early “presentation that I made to everybody … and I had selected this palette of color and here I am this little female telling them what colors they had to use, and they were all sort of stone-faced … And they said, but where’s the gray? We need gray with those colors.” But Sussman’s colorful vision for the Olympics would prevail, and her image for the city helped seal Los Angeles’s own design identity. For this work and for so much more, she will be greatly missed and long remembered — a pioneer in the fullest sense. Thank you for pointing out another important dimension of Deborah's weighty career, Elizabeth—that of her struggle as a woman designer. From the tributes written of Sussman's contributions it seems any gender issues that may have arisen were supplanted by her strong design vision. But, alas, it tool persistence and patience across the trajectory changing times that eventually paid off for her. And it is interesting to consider how her alliance with Paul Prejza may have helped tip the scales. While California is strongly associated with formulating new lifestyles and breaking with tradition, and probably more than anywhere else in the world designers who were women prevailed to became globally influential, many still had to struggle and overcome more "east coast" mindsets of gender inequality. Thank you Elizabeth Guffey for this beautiful tribute! Deborah Sussman brought art, intellect and rigor to our discipline and was an exemplar for impassioned women designers—one of the few that my generation had. Very sad that she has left this earth but know she will always be one of our muses. I don't know if Deborah though of herself as a civil rights hero but she was. As far as I am concerned, there are a lot of reasons for Deborah Sussman being a successful woman in the field traditionally dominated by men. I discuss it in detail in the following essay. On the one hand, Deborah Sussman found what she was interested in and then pursued it bravely. Although she studied painting and acted in student productions earlier at Bard College, she still chosed to transfer her studies to the New Bauhaus at the Illinois Institute of Technology when she found that she was really attracted by the eclectically avant-garde milieu of Black Mountain College. As she just intended to studied there for a short time. She even stayed there for three years because she liked it. I think there are a lot of young students at present studying what they do not like. Either they do not know what they are really interested in or they are afraid to make their interests to be their major for the concerns about the employment situation or other things.But if you do not enjoy your work or dislike it , it would be difficult for you to be outstanding in that field. On the other hand, as there is an old saying in China, lucky is also a kind of strength. Of course, lucky is never the decisive factor.For us, we need to grasp the opportunities whenever we find them.At IIT, Sussman met some good mentors. I think it is really important for her career. Working with the Eamses is an essential experience in her career, which also make her more confident about herself. The reason why she could be stand out from her peers was that she was skilled at drawing and gifted at model-making. So It tell us that opportunities are always for whom have been prepared. Before reading this article I never realized how much of Deborah Sussman work I was exposed to even though I don't live in the LA area. She was an pioneer for so many movements in the design community like being a women in a male dominated field, working on environmental design and civil rights. Her leadership role for the California New Wave brought LA it's our creative style that other cities across the countries tried to duplicate and inspire. Deborah Sussman is inspiration for all women who want to into design and working in a tough industry. I remember looking at her designs and being amazed from how innovative it was for the time and what she was doing. The color and life she brought to the 1984 LA Olympic's was definitely the most interesting design aspect of the 1980's. Her work and life will be greatly missed. While searching for an item in my plan chest this morning I came across a large folded piece of paper which you had pinned to my Olympic design HQ studio wall some 31 years ago! It was a drawing of a five-ringed pair of spectacles emulating my poster “Looking at the Look for the '84 Olympics”, which announced my talk to the Art Directors Club of Los Angeles. Your drawing accompanied the following message: “Hi Arnold! thanks for the pooster — see you soon? we're moving in sort of — Deborah Wed aft”. Each of the double “oo”s had spectacle arms drawn on them! The note provided me with a hint of your great sense of wit, a precursor perhaps to the recent wonderful photograph of you wearing your numerous pairs of spectacles! Your impending move into the facility signaling that you were soon to present to the world your unique look for the '84 Olympic Games. Just a few weeks ago Isolde and I attended the 30th anniversary celebration of the 1984 Olympic Games. Your absence was sorely felt as you were without a doubt a major contributor to the success of that Olympiad. It was always an education and such fun working alongside you and Paul. Coming from a background of working in black & white television, I could not fail to be impressed by your acute sense of color and style. I fondly recall the day you diplomatically changed the name of your Olympic Mariachi color palate to “Festive Federalism”. I saw you as a 21st century Mondrian, a mistress of color. I further recall the time you and Paul engaged me as your design consultant on London's Canary Wharf project and how I marveled at your confidence and skill of presentation. Somehow finding your note today prompted me to turn to my copy of the book “AGI graphic design since 1950”. As I opened its pages a bookmark fell out, its design included a photograph of a field of corn, and written in the sky was “from Deborah”. As the film reminds us, “If you build it they will come”, and they did, and so when you were elected in 1985 to AGI you had finally broken through the barrier for women to be internationally recognized in design in an organization which was traditionally a male-dominated profession. When I was elected in 1974 there had only been two women members. Through your many achievements in design, your legacy is now carved in stone. Dear Deborah, We shall miss your company at the AGI congresses, at those festive July Fourths that we spent together with mutual friends in Santa Barbara, and the Oscar viewing parties at your home. Our sadness for your passing is tempered with so many fond memories of the times that we spent together and of your colorful life. Isolde and I will ever remain among your enduring fans. 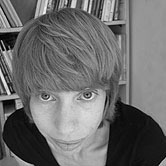 Elizabeth Guffey teaches and writes on art and design history, theory and criticism. She is the Juanita and Joseph Leff Distinguished Professor at Purchase College, State University of New York. Founding Editor of Design and Culture, she is also the author of Retro: The Culture of Revival. Currently, she is also completing the book Poster: Paper in the Post-Digital Age. Design For the Rest of Us: Where Are Design Museums’ Benches? What a lack of benches in design musems means for the exhibits.